San Jacinto St. & Caroline St.
Our cocktail lounge opens at 4 PM daily. 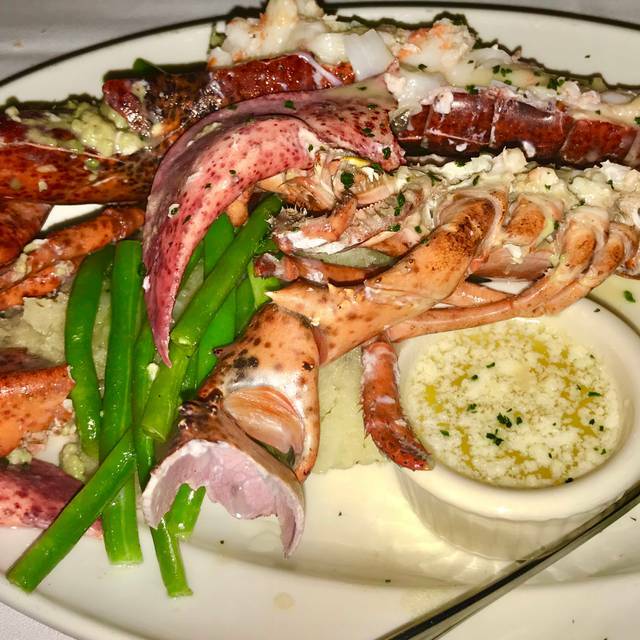 At Pappas Bros. Steakhouse, we put immeasurable care into everything we do, all to provide our Guests a dining experience like no other. The steakhouse features USDA Prime in-house dry-aged beef. 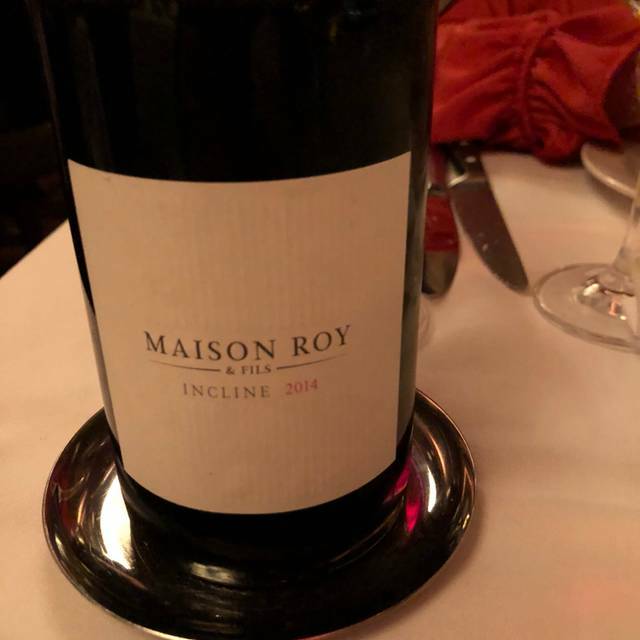 The award-winning wine list boasts over 3,900 selections, and the cellars have an inventory totaling over 30,000 bottles from every major fine wine-producing region in the world. We are minutes away from NRG Stadium, Toyota Center, George R. Brown Convention Center and Discovery Green. Always a great meal. Phenomenal wine list. 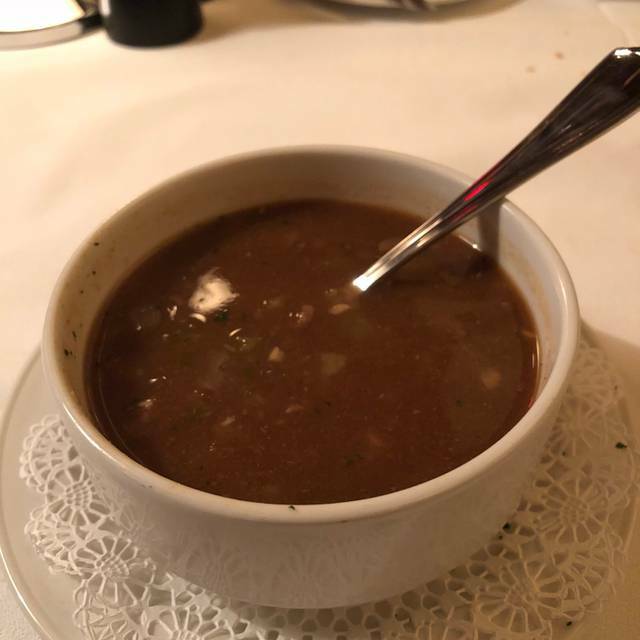 We've dined at Pappas Bros. Steakhouse a few times, however, this time the food was not as enjoyable. The steak was under-cooked and when it was return, it was tough and chewy. The asparagus and mushrooms were tasty, but the skillet potatoes were burnt. I ordered the peach cobbler for dessert and it was the worst. The peaches were still hard, the flavor was off and there was not any crust on the pie. Weird! My husband ordered the creme brulee and he enjoyed it. The manager did come and check on us and even provided the key lime pie to go. It was my husbands birthday and we both were a little disappointed and underwhelmed with our meal. Not sure if I will risk trying them again as the meals are quite pricey. Also, for Pappas to be an upscale restaurant, they let people in with jeans and sneakers. They really don't have a dress code that sets them apart from a mid priced restaurant. 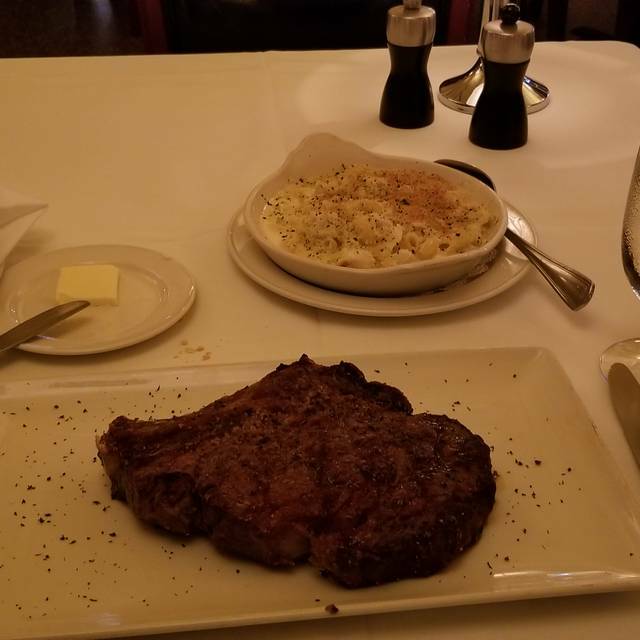 The aged steaks are the best in Houston. 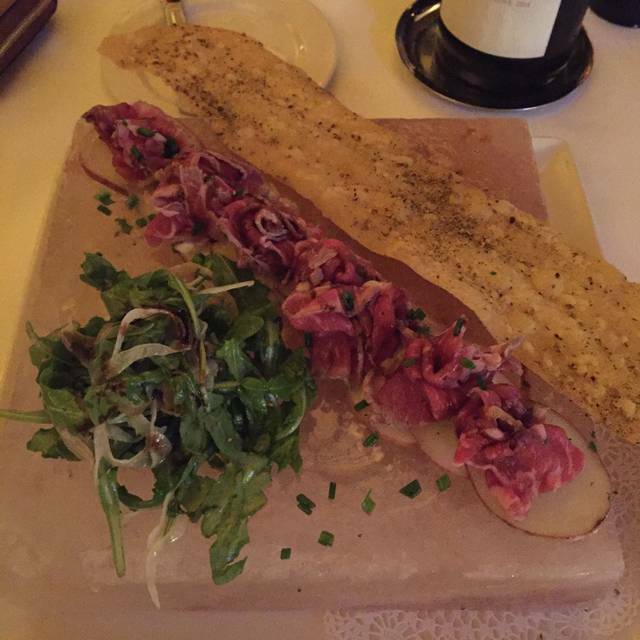 The wine list is extensive, but it is much higher priced than some other steak houses. Very good special occasion restaurant. I enjoyed the ambiance of the semi private room. When we got seated there were 3 other groups. After a few minutes we were the only one in the room. It was quite and easy to talk. Our server Matthew was always attentive even when we were the only people in the room. The food was reall good and the so was the wine. We had one issue with something being in the wine glass which was proply attended to. Here in town for a convention and easy walking distance from downtown hotels. Our server, Brian, was amiable, attentive and very informative about our dining experience and food choices. Service was excellent. Food was timely, delicious and was served at the perfect temperature. We had Ribeyes and filets that were cooked to the appropriate degree of doneness. Side dishes are served family style and are meant to be shared. 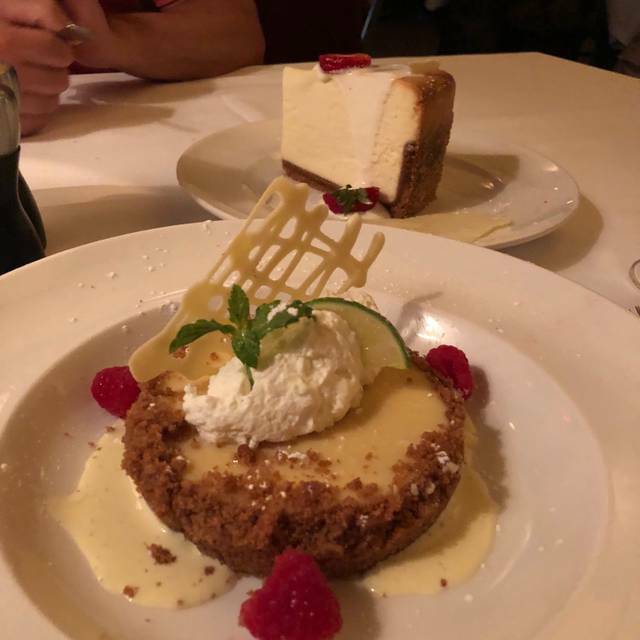 We topped off our meal with the key lime pie and a caramel butterscotch Blondie that were large enough to share. 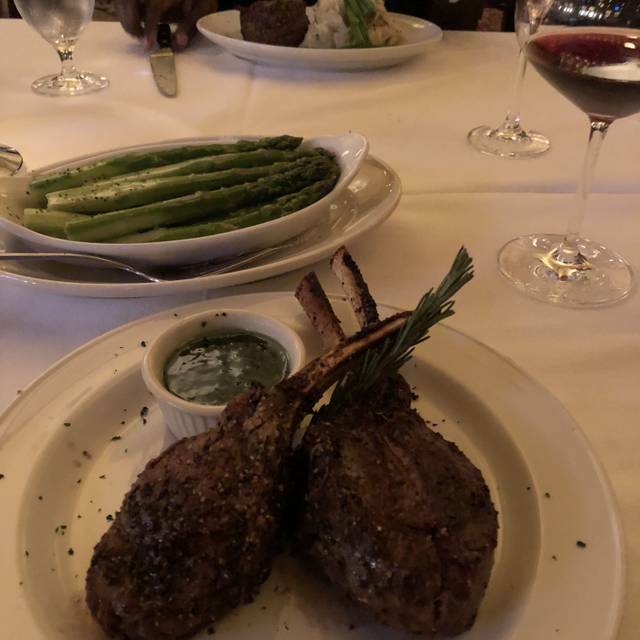 Great food, I highly recommend Pappas brothers for a fine steak house dining experience. Nice moderately priced "bar menu" options. Very nice atmosphere with live piano. Service was a little lacking, not bad, we just didn't get a ton of attention. Classy environment. Great wait staff and good overall service. Not just a steakhouse. My wait time at the bar was very enjoyable. Food was really good but my dinner mate had the fish topped with shrimp and it was just as good as the steak I ordered. I was really impressed with my 1st visit. It was everything other positive reviews said it would be. All the staff acknowledged our special occasion (my birthday) but didn't actually do anything to help us celebrate. The food was fabulous and our waiter had excellent suggestions. The wine list is impressively extensive and the sommelier was very knowledgeable. We were seated between the hostess stand and the kitchen. There were constantly service people "buzzing around", giving us the feeling that we were having dinner inside a beehive. The noise level was also high, made worse by the pianist in the bar. The volume of the piano & the conversations at all of the tables, with no apparent noise suppression, made it nearly impossible to have a conversation during our meal. We have been to many steakhouses and have had some of the best meals but Pappas Bros has made it to our top! We have a home town favorite in San Antonio but these guys provided just a better tasting steak over all. My better half always has to have A1 steak sauce ( I know) but she said it was totally unnecessary because of how much flavor this delicious piece of beef was!! My question now is when do we go back to Houston???? Great food and great service. Expensive but really good quality beef. I went with my parents who are older so it was a little loud in the main dining area for them. This was my second time at this restaurant as we are not from the Houston area. We will definitely go back while in Houston. Our waiter was outstanding and was attentive without being intrusive. He recommended some sides to go with our steaks and everything was made fresh, and it was the best dining experience I have had in 10 years. No detail was too small. Steaks were brought out made to order (rare, medium rare and butterflied and well done). Asparagus as big as your thumb. Mushrooms drenched in butter. Onion rings that were flaky, tasty and fit on a table of fine food. Recommended wine was well received. Pricey, but worth it. This is my boyfriends new favorite restaurant. The waiter was extremely knowledgeable on the entire menu and both our meals were amazing. The only complaint we had was that the side dishes were entirely too large and we barely made a dent in them. I chose this restaurant because I wanted to take my wife on a romantic dinner. We were both impressed. ONE OF THE BEST STEAK HOUSE EXPERIENCES I HAVE EVER HAD. Sat at the bar. Incredible staff, ambiance, music and the food was outstanding. Great service. Great Steak !!! Great place to entertain. Steak was amazing as were the vegetables. Service was excellent. Everything was excellent. The food was great. They were able to accommodate my dietary restrictions. However I was told that one of our sides would be on the house and come to find out that we were charged $15 for asparagus. Had I known that I would have never said yes. Otherwise everything was good, prices are not cheap but you get what you pay for. Just double check your receipt before you leave! Birthday dinner! Service was exceptional! Very attentive by everyone we came in contact with! Ambience was awesome! Food amazing! Jonathan was amazing. Spoiled us. One of the top steakhouses we have been to. Ambiance very club-like;it did get a bit loud as the restaurant filled. Service was spot-on, always present but never intrusive. Food was over the top from crab leg appetizer, Cuban black bean soup with Pico de Gallo and lobster, to our steak entrees which were perfectly prepared. Unfortunately, too full to sample dessert. Highly recommend! Food was great, steak was tougher than expected though. Server seemed too busy to be available when we needed something, took a while to see her, get her attention and then have the needs met. Great overall experience though. I previously wrote a review for Pappas Steakhouse that was my side of the story so I have deleted that text after someone close to me pointed out that there are two sides to every story. So, here’s my experience - I made a reservation via OpenTable - I received a confirmation that my reservation, a table for two, was confirmed. I called Pappas just to make sure the reservation made via OpenTable was received. I was told by Pappas that I had a reservation for 5:45 pm for two. However, when we arrived we were informed by the hostess, that there is no guarantee for a table. We were told we could sit at the counter. I did state that I wanted to be seated at a table not the counter. I also noted to the hostess that there were multiple empty tables in the dining room. We did get a table after our discussion and the manager did give us a gift card to use at another time. The waiter did a good job and the food was good. In conclusion, the first experience a customer or patron has at a restaurant is being greeted and seated. My experience was not what I expected. Had a great birthday dinner! Everything was perfect! 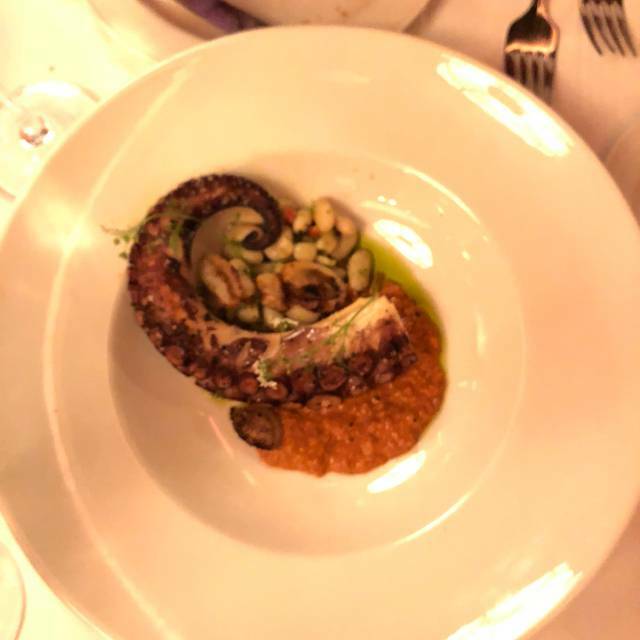 As always the food was exceptional as well as the service. Our server Matthew made the evening most enjoyable. This was our first visit to the Pappas Downtown location. The four of us included an out-of-town couple who love Pappas steaks. The food, as always, was beyond outstanding. From the variety of steaks we ordered to the sides and salads, everything was perfectly prepared and delicious. Differences we noted in this and the Galleria location were that, first, we got seated a lot sooner - a plus - and in a less frenetic environment. Service was a bit off, however. There were drink mixups and a forgotten coffee. Seemingly minor; but in the world we know as Pappas those things are rare. Nonetheless, it was an enjoyable meal. You can't top the best steaks in Houston. The best steak in Houston, with service to match. As beef producers ourselves, the steak was outstanding! 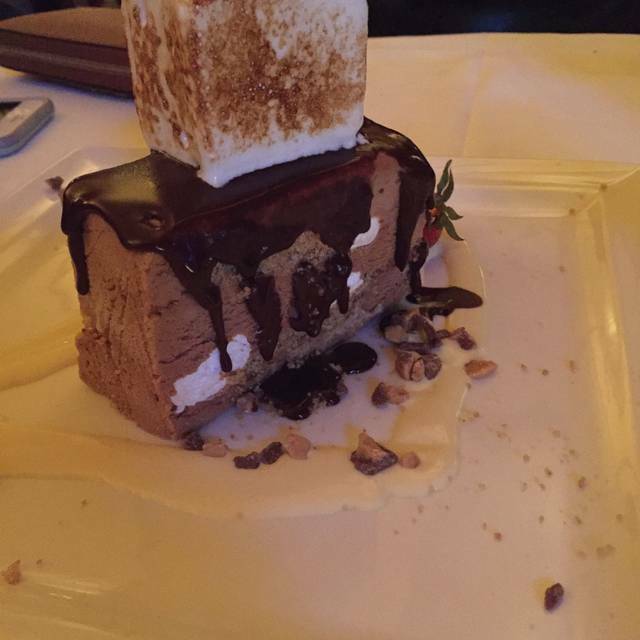 Ordered cheesecake for dessert! Awesome and definitely shareable! Still trying to figure out how they bake a cheesecake that big?! PLEASE PLEASE PLEASE bring back the Chilean Sea Bass! I will be coming quite a bit less often now that you don’t have my favorite entree in all of Houston. The Branzino was just ok. Does NOT measure up to the Sea Bass. We felt a bit ignored by our server. I had to ask the manager to get my girlfriend’s previously ordered drink. Our waiter seemed distracted by a large party at another table. Understandable, but we were paying for great service also. Otherwise, a great meal. EXELLENT!!! Steaks were magnificent, and recommendations from the sommelier (wine and after dinner) were on point. From Europe to Asia to across the US, certainly one of our top dining experiences! Beautiful space but odd acoustics from bowled light fixtures put neighboring tables ‘ conversation in my ear but couldn’t hear across the table. Service was professional and obviously well trained, but over scripted for a slight modification and question. Steaks were high quality. Bisque was a bit bland. Brussels were perfect. Dessert was good. Salad was fresh produce, for sure, but somehow disappointing for $15. Valet brought car seat from all the way back to nut crunching and left mirror way off. A bad last impression. Frankly, for $100 / head without alcohol, not an immediate sense of value, but the plusses were good plusses. Minuses were minor but still show why every detail must be managed at a high four star shop. Our server was awesome! Brandon the Somm was excellent as well - he gave us a great recommendation on a Crozes-Hermitage! Awesome Anniversary Dinner!